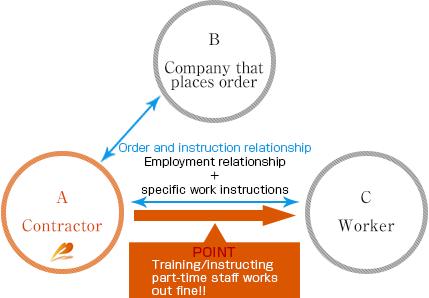 Business|Pacific Diner Service Co., Ltd.
What are dispatch, referral and contract work? Dispatch is to assign workers when a dispatch business operator receives instructions from a destination client (venue/hotel) to dispatch a worker (part-time staff) to work for that client. ・An employment contract is made between the dispatching business operator and the worker. ・The work is carried in accordance with the instructions given by the venue/hotel. 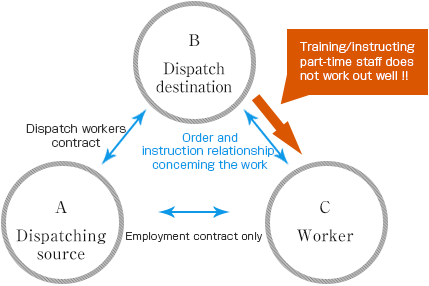 ・The employer of the worker is the dispatch business operator. Wages are paid by the dispatch business operator. 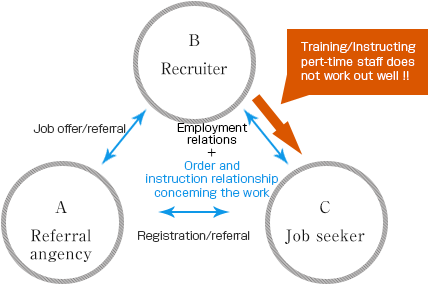 A referral is to refer workers when a dispatching company intermediates between a venue/hotel (recruiter) and worker (job applicant) to establish an employment relationship. As with regular part-time work, an employment contract is made directly between the “venue/hotel” and the “worker,” and the work is carried out in accordance with the instructions given by the venue/hotel. ・An employment contract is made between the venue/hotel and the worker. ・The work is carried out in accordance with the instructions given by the venue/hotel. ・The employer is the venue/hotel. Wages are paid by the employer. A contract work is provided when a worker employed by the contractor (Pacific Diner Service) is assigned to work that is ordered by the company that gave the order in accordance with the instructions of Pacific Diner Service. and strengthening of core business is possible. Time and cost required for talented-people reservation are optimized by evasion of management cost. The high team of the consciousnesswhich pursues a quality is obtained and begins to make Party beyond a visitor's imagination. High performance can be secured at a low cost, so that time and effort will be saved! !